‘Twas a time of trade, wealthy patrons and oil painting. Oil painting was introduced by Flemish painters and became all the rage 'cause you could get crazy special effects if you worked diligently with the translucent layers of paint. One of the leading lads of oil painting at this time was the Master of Flémalle, who art historians believe was Robert Campin. Hailed by all as the pioneer of paint, he ran a bustling workshop in Tournai, Belgium and in later years guys like Rogier van der Weyden would emerge as accomplished painters from the very same workshop. Campin used oil paint to full effect, and perfected the technique to an extent which made it suitable for depicting the spiritual realm in realistic, everyday settings, which was previously a taboo. We can't have Jesus walking around in the food court at the mall, can we? Due to his skill, Campin was an important guy. He held a bunch of municipal responsibilities for a while: he was dean of the painters’ guild and warden of a local church, to name a couple. But all that went down the crapper when he got involved in some episodes of misconduct. He was convicted for refusing to reveal some evidence in 1429, and this sent him on a walk...literally. He was sentenced to pilgrimage. Undaunted, Campin remained a rabble-rouser 'til 1431, when he was found guilty of adultery and expatriated for a year, until some heavy connections in the court got him off the hook. Moral of the story? It always pays to have friends in high places! Robert Campin (c. 1375 – 26 April 1444), now usually identified with the Master of Flémalle (earlier the Master of the Merode Triptych, before the discovery of three other similar panels), was the first great master of Flemish and Early Netherlandish painting. Campin's identity and the attribution of the paintings in both the "Campin" and "Master of Flémalle" groupings have been a matter of controversy for decades. Campin was highly successful during his lifetime, and thus his activities are relatively well documented, but he did not sign or date his works, and none can be securely connected with him. A corpus of work attached to the unidentified "Master of Flémalle",so named in the 19th century after three religious panels said to have come from a monastery in Flémalle. They are each assumed to be wings of triptychs or polyptychs, and are the Virgin and Child with a Firescreen now in London, a panel fragment with the Thief on the Cross in Frankfurt, and the Brussels version of the Mérode Altarpiece. Campin was active by 1406 as a master painter in Tournai, in today's Belgium, and became that city's leading painter for 30 years. 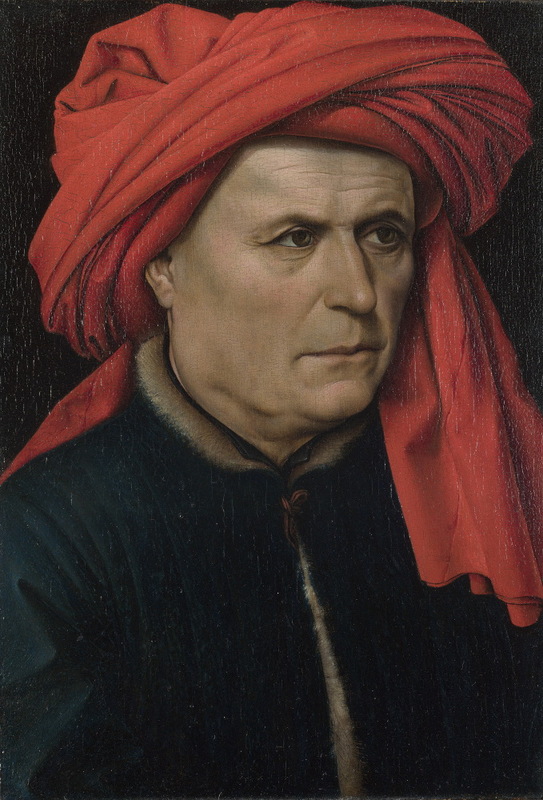 He had attained citizenship by 1410, and may have studied under Jan van Eyck. His fame had spread enough by 1419 that he led a large and profitable workshop. He became involved in the revolt of the Brotherhoods in the early 1420s; this, along with an extra-marital affair with a woman named Leurence Pol, led to his imprisonment. Yet he maintained his standing and workshop until his death in 1444. The early Campin panels shows the influence of the International Gothic artists the Limbourg brothers (1385 – 1416) and Melchior Broederlam (c. 1350 – c.1409), but display a more realistic observation than any earlier artists, which he achieved through innovations in the use of oil paints. He was successful in his lifetime, and the recipient of a number of civic commissions. Campin taught both Rogier van der Weyden (named in these early records as Rogelet de la Pasture, a French version of his name) and Jacques Daret. He was a contemporary of Jan van Eyck, and they met in 1427. Campin's best known work is the Mérode Altarpiece of c 1425-28. Check out the full Wikipedia article about Robert Campin.